Greetings and best wishes for a wonderful new year! 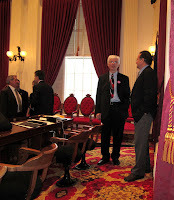 I am honored to be serving in the Vermont House as your representative. This is the first of the reports I will be writing while the legislature is in session. My goal is to keep you informed of activity in the House in general and of issues I am working on in particular. The first three days of the session consisted of organization and a great deal of pomp and circumstance. The session began on January 5th, and the first order of business in the House was to elect a Speaker of the House. Rep. Shap Smith of Morrisville was the unanimous choice to serve for a second term, and he was sworn in by Secretary of State Deb Markowitz. The members of the House were then sworn in by the Speaker. When Speaker Smith announced committee assignments, I was pleased to be appointed to the Committee on Natural Resources and Energy, my first choice. 6. recognize that Vermont’s tax capacity is saturated in terms of controlling costs of state government. Friday was the first real work day when we could meet in committee and review the upcoming agenda. In the Natural Resources and Energy Committee, Chairman Tony Klein ran through a long list of topics we will be dealing with, including the Sustainably Priced Energy Efficiency Development (SPEED) program, feed in rates for renewable energy generation, funding of the Clean Energy Development Fund (CEDF), and regulating the sulfur content of home heating oil, among others. One of the first bills, H.5 An act relating to returning moneys to the clean energy development fund (CEDF) to support solar tax credits, will recapture $2 million in redundant energy grants and make the money available for projects that were eligible for grants last year but could not be funded because the CEDF ran out of money. Several of the projects were already under way and had been counting on the grants that failed to materialize. Besides my committee work, I am also working on several unrelated pieces of legislation. At the request of Selectman John Owens and Shelburne Police Chief Jim Warden I am introducing a bill that will require coin & jewelry dealers to obtain positive ID of persons seeking to redeem jewelry or collectibles for cash and to cross-check their inventory against lists of stolen items maintained by law enforcement authorities. I have also asked for a review of the changes to the income sensitivity formula of the statewide property tax that resulted in significant reductions in property tax rebates to many homeowners in Charlotte. I also want to remind everyone that I will be at the Charlotte Town Office every 2nd and 4th Monday from 8 to 9 AM and from 5 to 6 PM if anyone would like to meet with me. I also welcome your calls and emails and will try to respond to all in a timely manner. If you would like to be notified when I update this blog, click on the "Follow" link in the menu bar above. I’m looking forward to a challenging and productive legislative session.